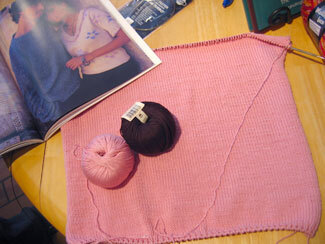 Another beautiful lace sweater underway by Terri. The pattern is Henley Perfected from Winter 2007 Interweave Knits and the yarn is the most delicious Debbie Bliss baby cashmerino. 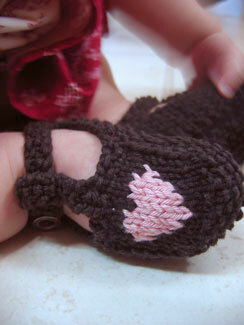 The beautiful baby booties that Terri made for my little girl. 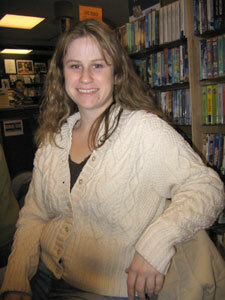 Terri finished the lovely lacy cable cardigan from Jo Sharp Knit - Issue 2. 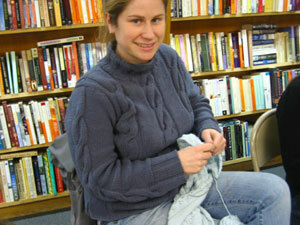 And she picked up some Calmer for another gorgeous sweater from the same book! 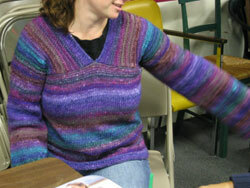 Terri in her pretty, pretty petal sweater. Aren't those little little glass buttons at the sides just precious? 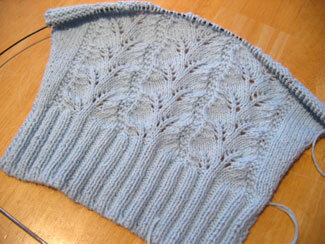 Terri's latest Rowan beauty on the needles: Sea Breeze from Rowan Classic Beach. 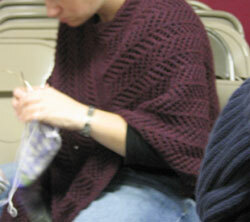 She's knitting it in the wonderful Classic Silk from Classic Elite. 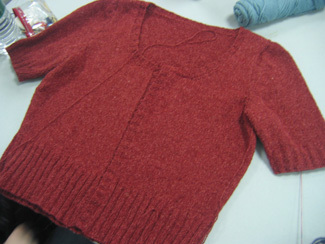 Terri's finished up another beautiful baby gift: a shawl neck pullover from Debbie Bliss' Baby Cashmerino 2 book. Awwwww. 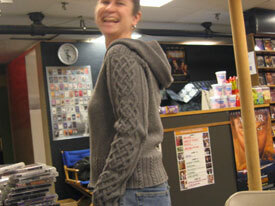 Finally, I manage to take a picture of Terri to do her and her knitting justice! This is her gorgeous new top in Rowan cotton glace. 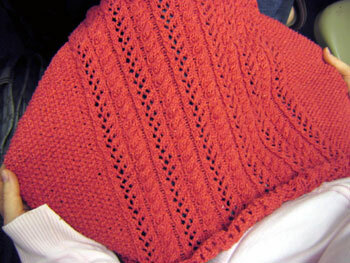 And another beautiful project she's just finishing: Tea Time from Rowan Classic Summer. 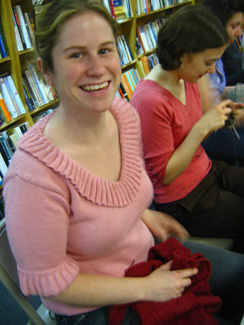 She knit it in the most amazing color of Elsebeth Lavold's Silky Wool. Terri's also working in blue. Her new Socks that Rock yarn is striping perfectly! 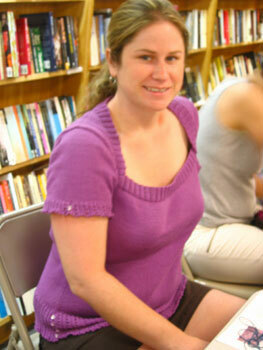 At the swap Terri wore her lovely, lovely cashcotton lace sweater (it's Julia from Rowan Classic Summer). 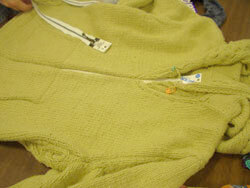 Sorry I didn't get a better picture of the sweater or Terri. You'll have to trust me that they both looked beautiful! 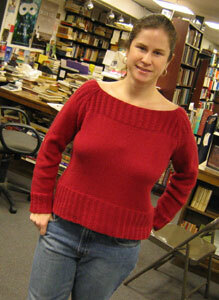 Terri wore her awesome all seasons cotton cabled sweater this week. Love it! Terri hasn't been able to make it to Knitsmiths recently, but I have caught up with her and taken a couple of pics of her latest projects. 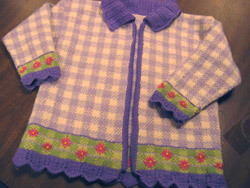 A baby set for a work colleage. (Love that bunny!) 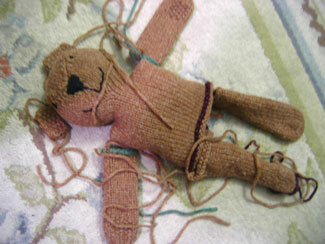 And she's also got a little bear underway. And for herself, a pretty pink top in Rowan cotton glace and a gorgeous lace sweater from one of the new Rowan Classic books in their Cashcotton yarn. Terri in a beautiful Debbie Bliss shawl collared cable cardigan - she wore it for Shannon to see (since Shannon's working on a similar one). 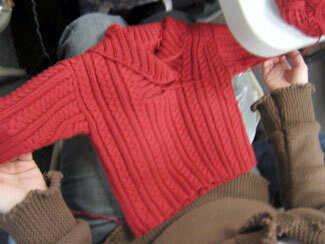 She was working on a beautiful red wrap sweater of her own creation. 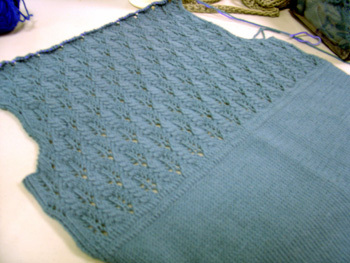 Terri's just finishing the first sleeve of Jo Sharp's Rebecca sweater, which she's making for her sister. 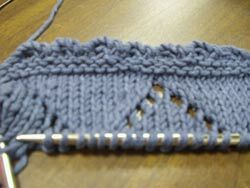 Don't you just love the shaping at the cuff?! 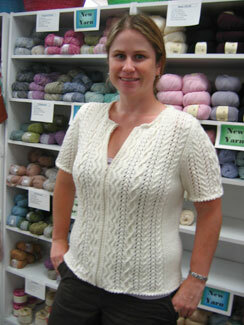 Terri's Mariah in Lana Grossa Big Merino. It's fabulous! Terri has done it again - another incredible sweater! She got this cashmere yarn at School Products in NYC and came up with this fabulous design herself. It's stunning! 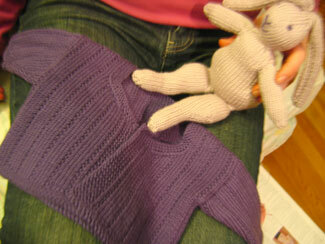 Terri's baby Dale is just a zipper away from being done. Such a special sweater and impressive accomplishment. Congrats, Terri! 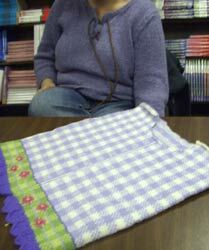 Terri is an amazing knitter! 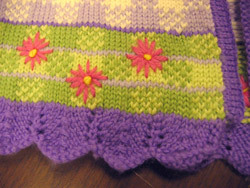 This week she brought in a finished poncho (her own design) and Klaralund sweater. 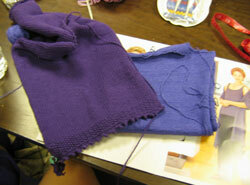 Terri's purple projects in progress. Rowan Calmer and Jaeger Sienna. Oh yeah. 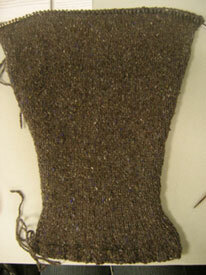 Terri's almost done with her Rogue cardigan. She just has to pick the right zipper and sew it in. The yarn is Blue Sky Organic Cotton and it is sooooo soft. This is going to be one amazing sweater. And lookie what she's starting next.... Smooch! Terri completed this amazing Dale sweater last month, so it's no surprise that she's got another beautiful Dale in the works. And yes, she knitted her own sweater too. It's in Rowan Summer Tweed and is so soft and lovely.